Food Animal Medicine(primarily Dairy Herd Health) and Companion Animal Medicine. The majority of her years in private practice were spent at Willingboro Veterinary Clinic where she made some life long friends with both colleagues and clients. Over the years she has been a Shelter Veterinarian, practiced in a Feline Practice and is now thrilled to be joining House Paws and being welcomed into her patients’ homes to provide high quality compassionate care. 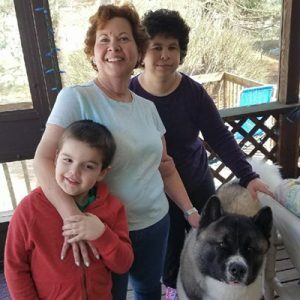 Dr. Phyllis lives in Cherry Hill with her youngest daughter Paige and their big, silly Akita, Maui. She is a lifelong member of the AVMA and also a member of the Akita Club of America and on the Health/Genetics committee. If not for the Cherry Hill Free Public Library she would be destitute, as she loves reading in her spare time as well as travel, exercise and enjoying time spent with her older daughter Valerie, son in law Joe and her beloved grandsons Jacob and Ben.